From The Washington Times. April 3, 2009. What’s this? The young man who burst upon the national scene ten years ago at the age of 25 crying "Down with Irony" is now committing paradox in the title of his new book? How ironic! Yet, when you think about it, For Common Things: Irony, Trust and Commitment in America Today, published in 1999, and this new book — Being America intervened in 2003 — are really complementary. Paradox without irony is no paradox at all, so that by first clearing the ground of irony, in his own imagination at least, Mr Purdy has made a way for himself to offer us seemingly paradoxical and even oxymoronic things — tolerable anarchy, possible utopia — that have been shorn of their difficulties and impossibilities and so converted into those "common things" that the earlier book was allegedly "for." It will be understood that this is strictly a rhetorical exercise. In the world where actual politics takes place, utopia remains as remote, anarchy as intolerable as they have ever been. 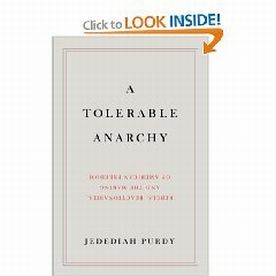 Taking for granted the success of his anti-ironist crusade, perhaps, Mr Purdy — who now teaches law at Duke after migrating thither from Yale and Harvard — has arrogated to himself Humpty-Dumpty’s privilege by which, when he uses a word, it means just what he chooses it to mean. "Freedom" is the main word he wishes to re-define — along predictably liberal-progressive lines — but along the way, there are a number of others. For instance, when introducing the remarkable concept of "personal utopianism," he claims that "Utopian needs to be more than an insult. Taking the word in a neutral sense, the first lines of the Declaration of Independence are utopian, envisioning a world of unprecedented political freedom and equality. Frederick Douglass’s insistence on equal dignity and Emerson’s on the sovereignty of conscience are utopian also." The grammatical error in making "the first lines" the subject of the participial "taking" may also suggest the anti-ironist’s belief in self-interpreting texts. But in thus reducing a perfectly good word to meaninglessness by making it apply to political or even psychological aspiration simply as such — we are all utopians now! — he imagines that he has said something new and important. Upon such sandy foundations as these, Mr Purdy feels confident in building towering edifices of nonsense, going on for pages, for example, about how "the utopian visions of one century became the pedestrian common sense of the next." The very idea of "utopia" and "utopianism" has therefore itself entered a utopian world where, instead of meaning an impossible state of perfection, it means nothing more than the next stop on the progressivist express. Such rhetorical legerdemain is significant for another reason. Utopianism is, or ought to be, analogous to a physical constant, such as the speed of light — something, that is, whose value is known and therefore in relation to which the variability of almost everything else can be measured. Utopia means "no place" in Greek because it stands for the impossible, the promise of perfection that rational inquiry knows in advance is false and impossible: like a slowed down speed of light. That’s why even Marx denied he was a utopian. For Marx it was the iron laws of history which were to produce the socialist paradise, not the wishes of such footling utopian dreamers as Charles Fourier, to whom Mr Purdy gives respectful attention alongside Johnson and Burke, Emerson and Frederick Douglass. Presumably, Marx knew that the serious political or moral philosopher must argue his case by saying, in effect, "See how here and here I have avoided the trap of utopianism." That’s one way in which he can affirm the validity of his thinking. If, instead, he embraces utopianism, he ceases to be serious, since we know by the premises of the craft that he is embracing impossibility. That Mr Purdy gets away with doing just that is partly owing to the fact that he is writing for an audience of progressive intellectuals among whom certain things are simply assumed. The media-academic consensus of American history as a triumphalist story of successive liberations from the oppressive classes of old or the dead hand of the past can be taken for granted, like the non-existence of irony where it is not intended. Such assumptions are shared with his audience, and they relieve both him and it of any necessity to come to grips with contrary arguments which, if they are noticed at all in this book, tend to be caricatured. "America’s foremost secular creed," Mr Purdy writes at one point, "is the belief that common sense, the heart’s impulse and the mind’s untrained judgment, solves [sic] all problems and removes all mysteries." Who actually believes anything so preposterous? Anybody? Yet Mr Purdy not only fails to mention a single adherent of this alleged "secular creed," he confidently proclaims it America’s foremost — all so that he can knock down another straw man of his own creation. In the same way, he knows that he can take for granted his audience’s assent to certain propositions about politics — such as, that the Iraq war and the Bush administration were political and diplomatic disasters [passim], or that "Ronald Reagan’s promise to restore a nineteenth-century ideal in twentieth-century conditions" was "sheer fantasy." Therefore, he has no need to justify such statements or even, as in the case of the second, to explain what they mean. Elsewhere, he writes of the "charismatic unreality" Reagan allegedly promoted, which "assigns utopian power not to any social program but to one’s own life, a place where dreams defy statistics to become real." More of that foremost secular creed, I suppose, though what this may have corresponded to in the political philosophy, program or deeds of the 40th president as actually proclaimed or performed, he sees no necessity to explain. Talk about fantasy! It’s hardly surprising that such a dealer in rhetorical toxic assets should write approvingly of the young Hillary Rodham’s now notorious belief, in her graduation address at Wellesley, in "more immediate, penetrating, and ecstatic modes of living." But she had the excuse of being 21 years old at the time. Now that he’s pushing 35, Jedediah Purdy is too old to go on playing the role of Wonder Boy.